What is the best augmented reality AR system for Esri GIS? vGIS Utilities was created differently from the ground-up. Read on to find out what makes vGIS Utilities the #1 augmented reality system for GIS. Augmented reality (AR) systems for GIS are not all created equal. Accuracy, stability, hardware requirements and myriad other factors impact real-life performance and benefits. Historically, the gap between expectations and the real-life performance was the major factor preventing the adoption of such systems: AR sounded good in theory but failed in practice. Accuracy is one of the two most critical components of an augmented reality system for utilities. A typical commercial or in-house-built AR system is only as accurate as the device’s internal GPS and compass, which has a stated accuracy of 10–30 m/30–100 ft. for the location and ±20° for the direction. To get sub-meter (sub-3-ft.) accuracy, an AR system requires high-precision GNSS that adds thousands of dollars of upfront investment (and possibly hundreds of dollars in monthly subscription fees) per user. Even then, the best directional accuracy is ±1.5°. vGIS has developed a patent-pending calibration technology that enables high accuracy (3–5 cm/1.5–2 in. location accuracy and ±0.1° directional accuracy depending on the area of operations) at no extra cost. vGIS also supports high-precision GNSS device integration so you can choose the calibration model that works the best for each individual user within your organization. The power of AR lies in its presentation of information in a format that helps one understand the surrounding infrastructure. vGIS is built on the most advanced proprietary visualization engine that depicts infrastructure assets in an appealing and easy-to-understand way. The system makes the depth, location and relative asset positioning plain and clear so you don’t have to guess what each line or point represents or where it is located. vGIS Utilities can display native GIS symbology, proprietary vGIS visuals, 3D objects and even complex 3D models. This is, perhaps, of lesser importance but is a fairly critical aspect of a good system. The vGIS team has dedicated User Interface (UI) and User Experience (UX) experts who specialize in designing user-experience-optimized systems. By conducting extensive prototyping, lab testing, feedback analysis and continuous refinement, the vGIS Team hides complexities “under the hood.” Aside from creating the most sophisticated yet simple interface, our UX research has practical benefits. Optimized UI and UX make the system easier to use, reduce the learning curve and make the system accessible to anyone even without technical acumen. AR systems usually fall into two categories: easy to set up but with very basic capabilities and visuals, or more capable and visually advanced but requiring weeks of manual setup time or even custom development. vGIS stands out as the single exception; despite offering the most advanced visuals in the industry, the system takes virtually no time to set up. By using a sophisticated and intuitive Admin Portal that automates most tasks, vGIS can be set up in minutes while delivering unparalleled visuals. vGIS is the only system that supports the full spectrum of technologies: Augmented Reality (AR), Mixed Reality (MR) and Virtual Reality (VR). 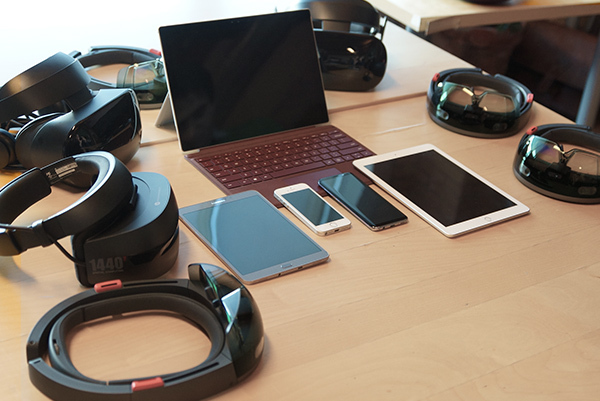 The broadest support of devices—from iPads and Android phones to Microsoft HoloLens and virtual reality goggles—lets you select the optimal tools for the job. vGIS lets you choose how you want data to be delivered to the device: real-time or cached. Each model has its advantages, and delivery can be optimized not just at the client level, but also at the data source level. All settings can be changed on the fly, so you are not permanently tied to a particular delivery model. vGIS is the only system that offers such GIS integration choices, so when other systems may display a “data is not available” message, vGIS will remain fully operational. Just like with ease of setup, AR systems offer a trade-off between price and capability. Most pricing models work on a “you get what you pay for” basis. vGIS is the noticeable exception; although affordable for even the smallest teams, it offers the best capabilities in the industry and thus, the best value in the industry. vGIS combines the most capable technology with affordable pricing. This drives exceptional ROI for the system, at 10:1–15:1 for active users such as utility locators and 3:1–5:1 for casual users who use vGIS once in a while. Analysis suggests that systems developed in-house offer negative ROI, as the high cost of development is covered by a single organization. Other commercial systems require investment in expensive hardware and additional software subscriptions and without which, offer limited practical benefits, driving down the ROI. vGIS Utilities is uniformly recognized by industry experts as the leader in augmented reality for the GIS space. From reputable awards (see below) to informal feedback from users who have piloted a variety of commercial and in-house-built AR systems, the acclaim for vGIS Utilities is consistent. It is the most accurate, stable and capable AR solution available on the market.